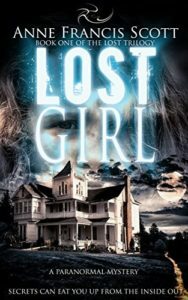 An early blog this month as Christmas is rapidly approaching, and two paranormal mystery authors to check out. In my Sci-Fi novel ‘Milijun’ a very small flying robot or MAV is used to access the Eucla military base in Australia. In today’s parlance, if they have a flapping wing, these vehicles are called Biomimetic Micro Air Vehicles or BMAV for short. There is a significant amount of research being undertaken in this area, mostly based on the study and replication of the Earth’s flying creatures. The intent is to make these robots as independent as possible from their controller. As you would expect, much of the financing is from the military sector. Early work soon concluded that MAVs in general had great potential for military applications. This inspired the US Defense Advanced Research Products Agency (DARPA) to fund additional studies in 1996. Although there were many biological studies on flying insects and birds that implied a future intention to design bio-inspired aircraft, the use of the term MAV did not become commonplace until after this time. Currently an MAV is generally defined as being less than 15 cm in any dimension. 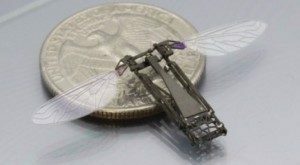 There are also nano air vehicles (NAVs) which are defined as being less than 7.5 cm in any dimension and 10 g (carrying a 2 g payload) in weight. MAVs can perform various a limited-duration missions. They are easily transported to a launch site and remotely flown by a single operator. They can investigate hazardous situations such as chemical spills and fires, in either open or partially restricted areas. Their size, of course, also makes them difficult to detect, so they are useful in police or military surveillance missions. There are three categories of MAV. They are distinguished according to their means of generating propulsive thrust and lift: fixed-wing (FMAV), rotary-wing (RMAV), and flapping-wing (also called biomimetic or BMAV). As the figure illustrates the BMAV as used in ‘Milijun’ follows an insect design. BMAV are bioinspired from the flapping wings of insects, birds, or bats. Lift and thrust are achieved by flapping the wings. Flapping the wings generates a greater force per wing surface area. Therefore, a BMAV has the potential to be much smaller than either FMAV or RMAV. The flapping frequency depends on the wing surface area. For example, dragonflies must flap at approximately 30 Hz, while bees (which have much smaller wing-to-body ratios) must flap at 200 to 250 Hz. [The hertz is defined as one cycle per second]. 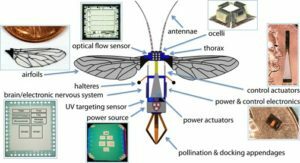 Looking forward, the team hopes that the Robobee may one day work as a swarm to execute reconnaissance missions, monitor environmental change, and even replace real bees by pollinating flowers and crops. Great advances have been made in automated flying small vehicles. Have a look at this amazing video from German automation giant Festo. Rather uncanny yet beautiful to watch. Whilst much of the current research activity is in the United States, there are growing programs in China, UK, France and South Korea. Other nations such as Malaysia are also showing an interest. In addition to the obvious military applications there are a multitude of civilian uses which spring to mind for MAV: reconnaissance following natural disasters such as floods, looking for survivors, fire fighting, checking out suspect vehicles. They just need to know when to go to ground!! The advantages of insect-type flight over other modes of operation are potentially huge. Flying insects are nature’s most accomplished aviators. Refined over 300 million years of evolution, their method is exceptionally power efficient, relatively silent and allows incredible feats of agility. 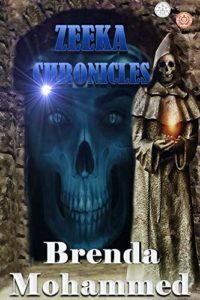 BRENDA MOHAMMED: Brenda Mohammed is the author of the mind-blowing science fiction futuristic thriller series Zeeka Chronicles: Revenge of Zeeka. The book won an award for Best Science Fiction in September 2017 from Metamorph’s Publishing Summer Indie Book Awards, received a five- star rating and five-star seal from Readers Favorite, won the gold award in the category science fiction in Emagazine Readers’ Choice Awards 2018, placed in the top ten finalists for the Author’s Academy Awards, and won an award in Reader’s Favorite International Book Awards 2018 in the category young adult thriller.